Patra's Other Place: Clothes to match the new car. 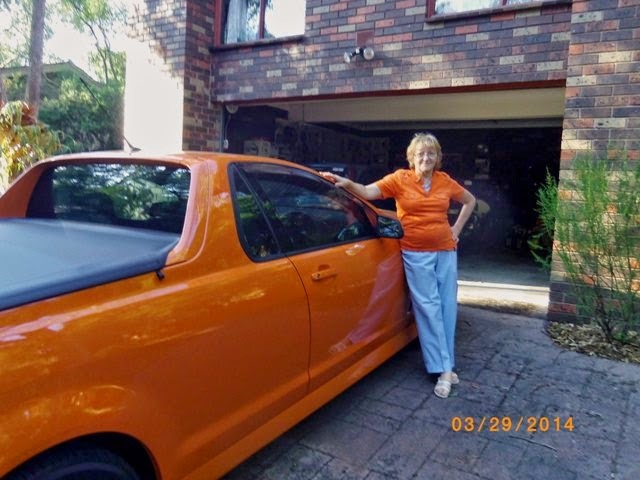 While we were over at Greensborough, Ken said he was thinking about looking for an orange teeshirt to wear when he was driving his orange car. We looked in Target and K-Mart but there was nothing to suit. Then we looked at some of the menswear stores, and at the third shop we found two identical orange tops - one large and one small. We tried them on, perfect fit, so we bought them...Yeah I know - TACKY. But fun. Here I am in mine, Ken wouldn't let me take his photo wearing his. Mind you, I won't be wearing it with blue pants in future! I had just put it on over what I was wearing the other day, without thinking of being photographed. Very swish, I love orange and think the t shirt looks great! Maybe black pants though.